Many of our editors like the Renegade best in base trim with the manual transmission, and a pricetag in the low-$20,000 range. The 2016 Jeep Renegade has something to please both off-roaders and commuters, but its performance can seem dull compared to its engaging styling. The Jeep Renegade is the smallest vehicle from Chrysler's own military-industrial complex since before Chrysler owned Jeep—literally, the smallest Jeep since the World War II-era Willys. As more than a foot shorter than the Cherokee, the Renegade works on a new mission for the brand: extending the brand around the rest of the world, where the appetite for small cars beats that of the U.S. market tenfold. For American drivers, the Renegade offers something a little different: the ability to buy an off-roader worthy of the Jeep name for a price in the mid-$20,000s, with the very latest safety and fuel-saving features to make it palatable as a daily driver. The Renegade has true Jeep functionality in a package that's not much smaller than the smaller SUVs from a decade ago. The Renegade ushers in a new look that fits more plausibly in the Jeep lineup than that of the bigger Cherokee. It's a tall, slab-sided, and upright little utility, but its stylists deliberately oversized some of the details to emphasize its heritage. The headlights flanking the seven-bar grille are large and round; the rubber-lipped wheel arches are large and trapezoidal, to emphasize strength. The taillights are stamped with "X" shapes in an homage to wartime fuel cans. Inside, the dashboard and console are slightly more robust versions of what you might find in a subcompact. The two center air vents sit in a little pod on top of the dashboard and resemble "Wall-E" to us. Ventilation knobs are large, round, silver, and easily to understand at first glance. There's hard plastic over larger surfaces, soft-touch vinyl where passengers may come into contact with a panel, and otherwise slightly oversized controls. The base engine is a 160-horsepower turbocharged 1.4-liter inline-4, putting out 184 pound-feet of torque, paired with a 6-speed manual gearbox. 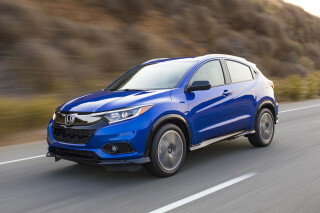 For more power, a 180-hp, 2.4-liter inline-4 producing 175 lb-ft of torque is combined with a 9-speed automatic gearbox—clearly the only such 9-speed in any subcompact on the market. All-wheel drive (AWD) is a $2,000 option with either engine, and in true Jeep fashion, it includes settings for extreme conditions: Mud, Sand, or Snow, plus a hill-descent braking mode. The top-of-the-line Trailhawk model, with an inch more ground clearance and different front and rear bumpers to allow steeper approach and descent angles, adds a Rock mode and the ability to crawl at very low speeds. The little Jeep is very capable off-road. We've driven it up a remarkably steep climb on rutted dirt and gravel roads, and then a descent at close to 45 degrees in which the Renegade braked itself and controlled the traction on each wheel as it slowly crawled down the steep track. It can traverse boulders almost as large as its 16-, 17-, or 18-inch wheels, ford streams, and generally acquit itself well in the kind of dirty, muddy, off-roading Jeeps (or their designers) revel in. It's no Jeep Wrangler, but it's good for a little utility. Still, Renegades will likely spend 95 percent of their time on city and suburban streets. As the entry-level Jeep, it's refined enough, but we've found ourselves preferring the base powertrain and front-wheel drive in urban driving. It's lighter, more direct, and rides lower than versions like the Trailhawk, which feels more ponderous thanks to its heavier weight and standard two-speed transfer case. Inside the Renegade, the front two passengers will be happy with their environment. 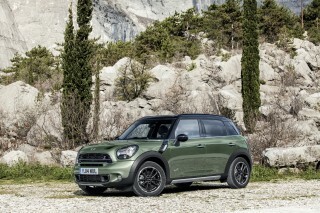 The front seats are comfortable and nicely bolstered, and the Renegade is clearly wider than other small SUVs, meaning the shoulders of the two front-seat riders are suitably separated. Rear-seat room is acceptable for two adults if the front passengers are willing to move their seats toward the dash, but this is still a subcompact, and rear-seat room isn't its strong suit. There's substantial cargo room behind the rear seat, which folds flat, as does the front passenger seat—allowing long items to be carried inside diagonally from dashboard to rear corner. The Renegade comes with seven airbags and stability control. A rearview camera is standard on all but the base model. Optional safety systems include forward-collision warnings and automatic braking, blind-spot monitors, and lane-departure warnings. Safety ratings, so far, have been mid-pack—considering that there are a number of very high-rated vehicles in its class. The Jeep Renegade has earned four-star overall ratings from federal testers, including four stars for front impact and five for side impact, and the IIHS has given the Renegeade "Good" scores in most of its crash tests, except the small-overlap crash test. The Renegade comes in four trim levels: the base Sport doesn't come standard with air conditioning or cruise control, which means the mid-level Latitude ($22,290) and the top-of-the-line Limited will be the versions most drivers will seek out. All-wheel drive is a $2,000 option. All can be ordered with either powertrain and with front- or all-wheel drive. The Trailhawk is the Renegade for off-road fans; it comes with all-wheel drive and the larger 2.4-liter engine with the 9-speed automatic, and offers a nifty removable sunroof system that opens the Renegade to the sun or stars, but not without a special wrench and a few minutes to spare. In its base version, the Renegade is rated at 24 mpg city, 31 highway, 27 combined, according to the EPA. That's for a Renegade with front- or all-wheel drive and a manual transmission, as well as the base 1.4-liter turbocharged inline-4. Upgrade to the 2.4-liter inline-4 with the 9-speed automatic transmission, and the Renegade earns EPA ratings of 22/31/25 mpg with front-wheel drive and 21/29/24 mpg with AWD. The Renegade perfectly straddles the line between cute and rugged. The Jeep Renegade blends just enough tradition into its urban-sized body to pull off a neat feat. It's essentially an Italian-built hatchback that looks more authentically Jeep than the crossover-ized Cherokee in the next size class above. The side profile is upright and square, with that bluff front end, a vertical tailgate, and a windshield with very little rake. For something so slab-sided, so upright, so tall for its overall length, the Renegade could hardly be anything but a Jeep. The Jeep grille and its hallmark seven slats are more pronounced than on the Grand Cherokee; the round headlights are a lovely callback, and they're etched with a mini Jeep icon in the lamps. The rubber-lipped wheel arches are large and trapezoidal, and the bumpers at each end are stamped to show off their strength. There are Jeep-themed Easter eggs all over the design in fact, some of the deliberate cues that emphasize its Jeep heritage while distracting from the fact that it's about the size of a Mini Countryman. At the rear, the Renegade's square taillights have an "X" pattern in them that the designers said they had appropriated from the one stamped into WWII fuel cans for strength. There's a map of the Detroit skyline in a rubber bin pad, and a tiny Yeti climbing up the edge of the rear windows. The base Renegade Sport model has some trim done in flat black—mirrors and taillight surrounds, for instance—but on a Jeep, it's less downmarket-looking than it might be on a small sedan or hatchback. A black-painted roof is optional on the Latitude mid-level trim, standard on the Limited high-end version, to emphasize the windshield frame and rear panel over the tailgate, which appear almost like roll hoops. Several little design touches further distinguish the toughest Trailhawk model, including black aluminum wheels and tow hooks painted bright red. Inside the Renegade, the best way to describe the interior furnishings, dashboard, and console is to consider them tougher, more robust versions of what you'd expect in a subcompact car—but with slightly oversized controls and those little Jeep design flourishes. Ventilation knobs are large, round, silver, and easily to understand at first glance. The two center air vents sit in a little pod on top of the dashboard and resemble "Wall-E" to us. For a Jeep—much less an entry-level Jeep—the Renegade's interior is refined and not all that Jeep-like, more toward the practical but generic Subaru end of the scale. In fact, if it weren't for the military-inspired textures and numerous Jeep logos all over the car, you might not know it came from the Jeep brand at all. The instruments and display contain their own Jeep cues, though: The red zone the tachometer is an irregular "splat" shape that the designers said was meant to evoke a paintball splash. And if you order the park assist, the display screen shows original Willys-Jeeps from the 1940s for each parked car around which you're maneuvering. The Trailhawk performs like a Jeep should; the Renegade isn't quick, though, and the ride can get rough and rumbly. Jeep sells the Renegade with a choice between two different four-cylinder engines, each with a choice of front- or all-wheel drive. The standard engine in the Renegade is a turbocharged 1.4-liter four-cylinder, with 160 horsepower and 184 pound-feet of torque. It's paired only with a 6-speed manual gearbox. Among our editors that have driven this combination, it might be the favorite: it makes the most of the Renegade's size with a more energetic feel, so long as it's unencumbered by all-wheel drive (AWD). The combination is roughly 150 pounds lighter than versions with the bigger engine and more complex transmission, and it moves the basic front-drive model around adequately. We haven't been able to test this combination with all-wheel drive, which adds roughly 150 pounds. Most Renegades come with a more powerful drivetrain, one that pairs a 2.4-liter 4-cylinder engine with 180 hp and 175 lb-ft of torque to a new 9-speed automatic. It's one of the first 9-speeds on the market, and it's come to market with some of the same shift quality issues we've noted in other Chrysler 9-speeds, including the Chrysler 200. The gearbox occasionally hiccups and executes jerky shifts as it tries to hunt through its dizzying array of gear choices—and the top ninth gear is something we don't think we've ever engaged in real-world driving. The lower gears are staged to draw as much acceleration from the non-turbo four. The driving experience with the more powerful powertrain is heavier and more ponderous behind the wheel, nonetheless. There's a fair amount of drivetrain noise for only a moderate payback in acceleration. Shifts can be lumpy. The electric power steering doesn't provide much feedback, but it's tuned well enough that it fades into the background and many drivers won't notice the difference. Though passengers sit high in the Renegade, increasing the sensation of body roll on sharp curves, it holds the road comfortably and is slightly faster on winding roads, when pushed, than you might expect from such a tall and blocky vehicle. Renegade SUVs with all-wheel drive have a few nifty tricks baked into their hardware. For one, they're programmed to launch with all four wheels powered—unlike many AWD systems that wait until a wheel slips to vary torque. After it's launched, the Renegade's SelecTerrain system gradually tapers off power sent to the rear wheels until the front wheels are doing all the work above 40 mph. Then, if the vehicle detects wheelslip, or if the driver selects a distinct traction mode, it varies torque between the front and rear wheels. Those driver-selectable modes include Mud, Sand, or Snow, plus a hill-descent braking mode. To maximize fuel economy, when AWD Renegades are propelled only by the front wheels, none of the components of the rear driveline, including the propeller shaft down the length of the car, move at all—reducing friction losses and even aerodynamic drag. It's a variation of the system found in the larger Jeep Cherokee, and in our test drive, we found the transitions to be imperceptible. For the most rugged driving experience, Renegade owners will want the Trailhawk. While it's no Wrangler, the Trailhawk is quite capable off-road thanks to 8.7 inches of ground clearance, skid plates, and its own front and rear bumpers, designed for better approach and descent angles. Its traction modes include a Rock setting, and it gets a two-speed transfer case with an extremely low-speed crawl ratio of 20:1. With that hardware, the Renegade can amble up steeply rutted dirt roads, and can crawl its way down 45-degree hills, braking itself to slow its progress to a manageable clip. It can ford streams, climb over boulders close to the size of its 16-, 17-, or 18-inch wheels, and it generally acquitted itself well during the little sample of dirty, muddy, off-roading we were able to do. It also weighs almost 3,600 pounds, giving it a solid feel for such a small Jeep. That said, however, most Renegades will likely spend the majority of their miles in city and suburban usage. There, it's easy to park (due to its square-cut shape) and has a 36-foot turning circle (35 feet on the Trailhawk) that felt surprisingly small, making the Renegade more maneuverable than expected in tight quarters. The Renegade's cabin is wide and well finished, but rear-seat space is snug and it can be noisy. The Renegade has more interior space than some of its rivals—in terms of width, at least. While it's comfortable for front passengers, rear-seat room is more snug, and the Renegade's cabin can seem noisy. The Renegade benefits from a cabin that's wider than some main rivals, like the Chevy Trax. It lends the feel of a larger vehicle, particularly in the front seats, where the well-bolstered chairs have good padding and comfort. They're also divided by a console with lots of storage space for mobile phones and the like; the electronic parking brake switch takes up just a little space, leaving enough room for a pair of big cupholders and a useful, locking bin. 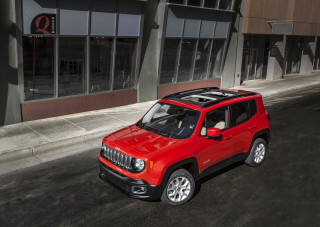 The Renegade has the footprint of a subcompact car, so not all passengers will get the same spacious treatment. In back, the combination of its small overall dimensions and the location of its all-wheel-drive mechanicals trims out space, so that adults will feel less comfortable on long trips. There's just enough leg room for 6-footers to ride behind 6-footers—if everyone involved is good with sharing—and head room and shoulder room are good, but those back-seat passengers will find their knees right up against the backs of the front seats. Behind the rear seat, the Renegade has 18.5 cubic feet of cargo volume. The rear seat folds flat, and so does the front passenger seat back, which makes room for long items (think a short surfboard) to be carried inside diagonally from the right side of the dashboard to the left rear corner of the cargo bay. With the seats folded, cargo volume rises to 50.8 cubic feet. The materials mix hard plastic in larger surfaces with soft-touch vinyl where passengers may come into contact with a panel. Door panels are a mix of nylon and cloth textures, and we found the two-tone interior in one test car—in black and "sandstorm" tan—particularly fetching. Under most circumstances, the Renegade is surprisingly quiet and refined on the road for such a blunt, tall vehicle. But tire noise varies hugely, from almost none to a great deal on certain types of rough concrete roads. Still, in most cases, there's essentially no wind noise until you hit 70 mph or more. That's doubly impressive when you factor in the nice big rectangular door mirrors and the relatively vertical windshield. There's also a fair amount of drivetrain noise when the turbocharged four-cylinder winds up into its powerband, and as the transmission and driveline whir in congress. Safety ratings for the Renegade are mid-pack, in a segment of strong safety performers. All Jeep Renegades come with seven airbags and stability control, while most models also come with a rearview camera. On the options list, there's a frontal crash warning system with automatic braking; a lane-departure warning and correction system; rear cross-traffic alerts; and blind-spot monitors. The Renegade's upright seating position helps visibility to the front and sides, as does a relatively low window line—and of course, so does the square-cornered styling. The Renegade's door mirrors are big and rectangular, which doesn't do much for aerodynamics but gives an excellent view to the rear. However, the view from the driver's seat to the rear quarters isn't great. A small third window and thick roof pillars cut into the view. The Jeep Renegade has earned four-star overall ratings from the NHTSA, including four stars for front impact and five for side impact, but only three stars in the calculated rollover test. The IIHS is complimentary, but not complete. The Renegade's optional frontal crash protection earned it an "Advanced" rating by the agency. Last year, the Renegade managed top ratings by the IIHS in every category except the small front overlap crash and head protection categories, where it earned "Acceptable" ratings. For 2016, the Renegade is only "Good" in moderate front crashes, side protection, and roof strength. Features are big, and so is the price tag if you load up the Jeep Renegade. With the Renegade, Jeep offers a variety of trim levels and powertrain combinations that result in a wide price range. Sports start from the low $20,000s to more than $30,000 for a Trailhawk edition. 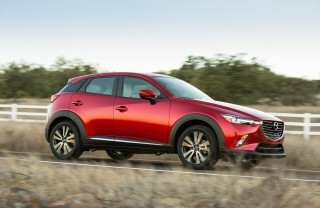 It's unusual that all-wheel drive is available with either powertrain as a $2,000 option. For the 2016 model year, the Renegade is now offered with a premium sound system with 506 watts delivered through nine speakers and a 6.5-inch subwoofer. 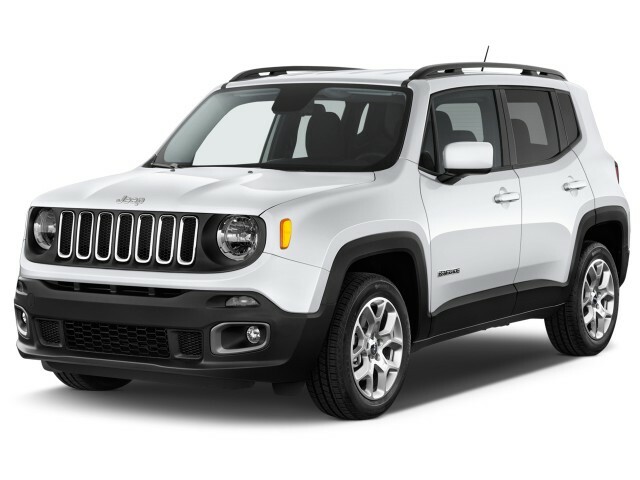 Every Renegade comes with power windows, locks, and mirrors; an AM/FM radio with four speakers; a removable, height-adjustable cargo floor; 12-volt power outlets in the dash and cargo area. 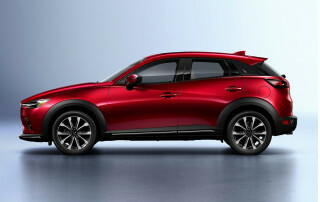 The base Sport model does not come standard with air conditioning or a rearview camera, and it also omits the fold-forward front passenger seat offered on all other trim levels for longer cargo loads. The Renegade's list of features quickly grows from comprehensive to exhausting. There are 10 different equipment groups that offer everything from cruise control and air conditioning to leather seating and in-car wireless internet. The best values include the Latitude, which gets ambient lighting, AM/FM/XM audio with Bluetooth connectivity and audio streaming, 16-inch alloy wheels, and a leather-wrapped steering wheel. Renegades in Limited trim offer power front seats; a 115-volt power outlet; a split-folding rear seat; a 180-watt audio system; and heated leather front seats, along with 18-inch alloy wheels. Then there's the Trailhawk, with its greater off-road capability, that only comes with all-wheel drive and the larger 2.4-liter inline-4 and 9-speed automatic transmission, a rock driving mode and two-speed transfer case, and a full-size spare tire standard (that's an option on the other trims). The Trailhawk can be ordered as a relatively standard model or loaded up with all the luxury features of the Limited trim. Several features of each trim level are optional on the level below, and several choices of optional 17- and 18-inch wheels can be added. Other options include a wi-fi hotspot that can be added that turns the entire car into a local router with the addition of a cellular phone card. There's also a Uconnect system with a 6.5-inch touchscreen display, navigation, AM/FM/SiriusXM radio, HD radio, SiriusXM real-time traffic, and Bluetooth connectivity. Jeep is particularly proud of its MySky sunroof option, consisting of two entirely removable glass roof panels. Either fixed or power operated, they require a special Allen key to unlock the clamp in the headliner that holds them to the car. The pair of panels fits into a specially tailored bag that slides underneath the rear cargo deck when its movable floor is set to the highest position. Overall, it's a neat system for owners who really want open air badly, but not something you'll simply pop and flip open at a stoplight. 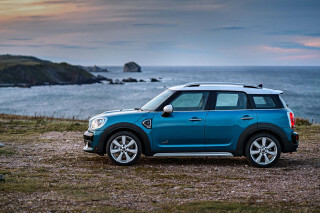 Fuel economy isn't the best among small SUVs, at up to 27 mpg combined. The Renegade's fuel economy is only average, when it's compared to some of its very efficient rivals. In its base version, the Renegade is rated at 24 mpg city, 31 highway, 27 combined, according to the EPA. That's for a Renegade with front- or all-wheel drive (AWD) and a manual transmission, as well as the base 1.4-liter turbocharged inline-4. 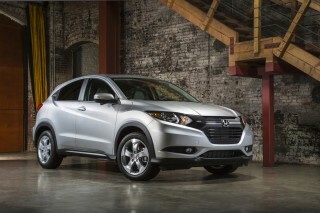 Those figures are at least a couple of miles per gallon lower than the class champ, the Honda HR-V. It's pegged at up to 29 mpg combined with all-wheel drive, and up to 31 mpg combined when outfitted with a continuously variable transmission and front-wheel drive. 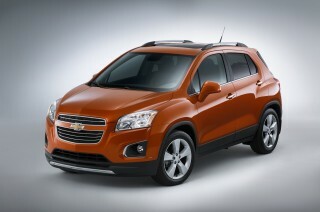 Another example: The Chevy Trax is rated at 24/31/27 mpg with all-wheel drive. 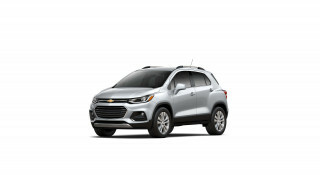 If Trax buyers forgo the AWD, its ratings rise to 26/34/29 mpg. very easy to get in and out. I have the 9 speed auto, with the power seats. My Wife & I both like the car very much, as it is easy to get in & out, this is important as we are both older than 75. Pleased as punch right now! Super cute and fun to drive! Traded my 2003 grand cherokee. So this was a downsize for our family of 4, but plenty of room for us! Better on gas, cute, plenty of spunky get up and go. I have no complaints! Not a 'traditional' Jeep, and that's a good thing. Looking for a different year of the Jeep Renegade?